There are very few stadiums in the world that leave you truly speechless when you walk in. Maracanã is one of them. The other one is Real Madrid's Santiago Bernabéu, the best club of the 20th century. The famous coliseum is getting a major remake. It looks like a spaceship about to start abducting people. Which, actually, is not far from the truth, figuratively speaking. I still remember the first time I walked in as a kid and was physically pushed back by the wall of sound from what seemed to be a billion souls screaming at the same time. I still get goosebumps from that sound and the impressive view every time I go to watch a game. I guess similar experiences is what "abduct" people, making them fans of the different teams—the communal experience, the sensory overload. 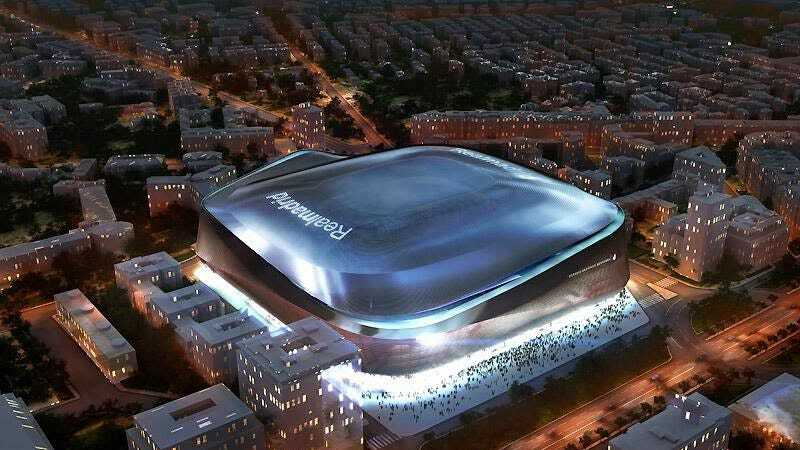 The new Santiago Bernabéu will retain that crazy experience and even increase it. Inside, there will be even more seats. As you can see in this video, it'll have a crazy 360-degree LED display that will surround the top of the stadium, making it look like the interior of an alien mothership too. Outside, it will have a completely new skin made of titanium. Real Madrid says it's a smart skin, which will dynamically change to protect the interior from the elements. Images would be projected on this surface too.